Al-Ghazali was a highly influential 11th century philosopher, theologian, and Sunni mystic. His most important work, The Incoherence of the Philosophers, had a profound impact on Islamic theology and philosophy in the coming centuries. He mainly argued against the Aristotelian metaphysics that had been adopted by earlier Islamic philosophers, such as Avicenna. He claimed that the kind of metaphysics that they were doing wasn't logical, and only theology could reveal the ultimate truths of the world. So while we could certainly investigate the natural world, metaphysical doctrines like the Active Intellect were untenable. Instead, he put forward a doctrine of Occasionalism, which claimed that God was responsible for all events directly. So, for Al-Ghazali, nothing is caused by secondary natural causes, God does literally everything. The world appears to behave as though some things repeatedly cause others because God is rational, so he would do the same thing under the same circumstances, generally speaking. Al-Ghazali was so influential that there are some who claimed his "irrationalism" caused the entire downfall of the Golden Age of Islam. In this view, I suppose, it is just sort of a massive coincidence that the Mongols invaded shortly after, killing millions and practically wiping Baghdad off the map (which was the intellectual and cultural center of the Islamic world at the time). According to one account they threw so many books into the river that the Tigris ran black with ink, and red with the blood of the philosophers they killed. But, you know, it could have been the doctrine of Occasionalism too. It is kind of a wacky idea. Averroes (Ibn Rushd) was a very important 12th century philosopher, best known for his commentary on Aristotle. He published a critique of Al-Ghazali, titled The Incoherence of the Incoherence. 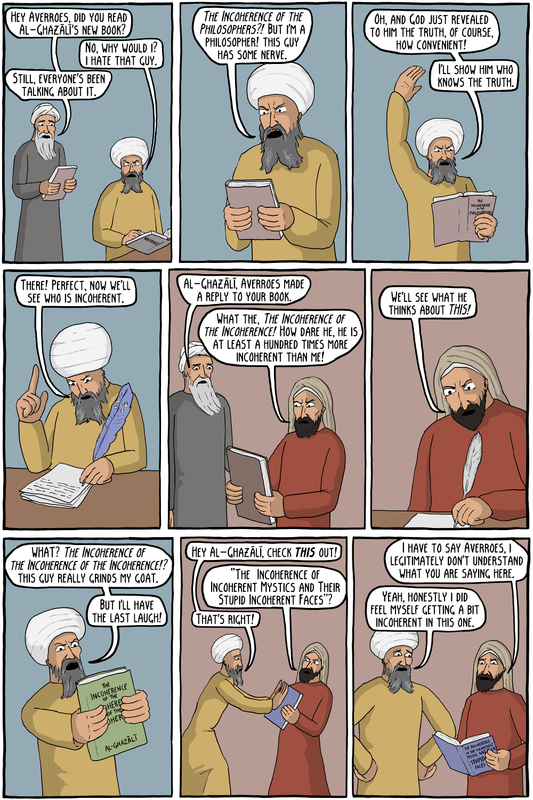 Had Al-Ghazali still been alive, what is depicted in the comic surely would have come to pass. Instead Averroes went on to publish many more important commentaries on Avicenna and others, and was largely responsible for a renewed interest in Greek thinkers (especially Aristotle) in Europe. He actually lived in Andalusia, in modern day Spain, and was influential among European philosophers (in fact Thomas Aquinas lists him as one of the great philosophers, calling him simply "The Commentator".